The disastrous results to the economy, lost jobs and the $16 Billion deficit as we near the end of the Obama Administration’s first term are the fault of the Democrats takeover of both Houses of Congress in 2007 and President Obama, NOT President George W. Bush! The Democrats took the majority in both the U.S. House and the U.S. Senate at the very beginning of Bush’s second term, January 3rd 2007, 2 years before Obama took office. The Democrats controlled the budget process for 2008 & 2009, as well as 2010 & 2011. There’s a great article from the American Thinker called “It’s Not Bush’s Fault” by Ben Voth. I have paraphrased a bit but these points were pulled from this lengthy article almost verbatim. A couple of the talking points are from other sources, including from the book, Throw Them All Out by Peter Schweizer. If you just read Chapter 5 of Schweizer’s book and it will turn your stomach. You will “throw them all out” including our illustrious president. In the fall of 2006, the media and associated public culture celebrated the landslide win of Democrats in congressional elections that brought strong majorities in both the House and the Senate. The U.S. Congress holds the exclusive constitutional power over spending. Congress is charged with oversight roles regarding government economic activities such as Fannie Mae and Freddie Mac. Barney Frank took over the House Financial Services Committee and Chris Dodd took over the Senate Banking Committee. As key leaders Chris Dodd in the Senate and Barney Frank in the House received huge campaign support from these GSEs that held the majority of American mortgage finances. Senator Obama was himself a tremendous recipient of campaign funding from Fannie Mae and Freddie Mac. Fannie Mae and Freddie Mac that controlled trillions of dollars in American mortgage equity. The government was not supervising its own interference in the free market. The housing market in the U.S. devolved into a dangerous leveraged global gambling operation that financed a vulnerable house of cards over European banks. The leadership of Fannie Mae and Freddie Mac knew that the election of Democrats in the House and Senate would prevent any further calls by the Bush administration to tighten the regulations on these dangerous GSEs. The unemployment rate was half the over ten-percent levels it would rise to under President Obama. 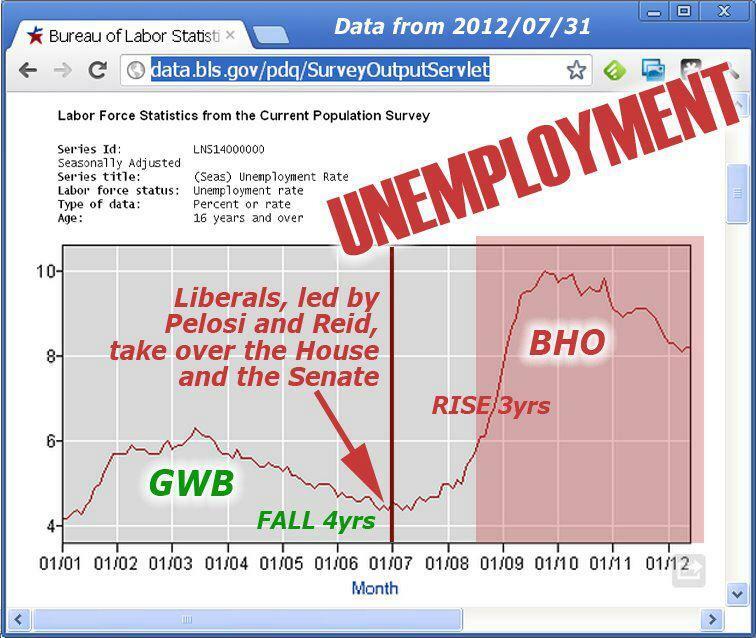 The long spell of high unemployment under President Obama and the slight fall in unemployment under President Obama is attributable to individuals giving up on seeking employment. The tax cuts of the Bush administration had in fact produced record tax revenues — more than $2.5 trillion annually. Today, the government barely takes in $2 trillion. The 160-billion-dollar deficit for 2007 was part of a larger downward trend from the past two years. In 2009, while Barack Obama was a U.S, Senator, Nancy Pelosi & Harry Reid passed continuing resolutions to keep government running until Barack Obama took office. At that time, they passed a massive omnibus spending bill to complete the 2009 budgets. Barack Obama later signed the omnibus bill as President. Today, annual deficits are ten times larger — surpassing the one-trillion-dollar mark with regularity. Five years ago, the U.S. annual deficit was 90% lower than it is today. The markets did not express a sense of relief upon the election of President Obama in early November 2008. What ensued was an economic panic. Business leaders feared the coming onslaught of regulatory and redistributive fervor of President-Elect Obama and his supporters. The Bush bailouts for both the financial industry and the auto industry required the funds to be paid back. In fact, in both bailouts, these funds have been paid back to the Treasury. The success of bailouts — both for the recipients and more importantly for taxpayers reflects the fiscal conservatism and successes of the Bush administration. These were temporary emergency funding actions that were paid back by the recipients with interest. The Obama budget office has switched the payback funds into general operating expenses of the nation that support his general revisions to stimulus that do not require recipients to repay — such as the funds for Solyndra. Speaking of Solyndra, as part of the $700 Billion Stimulus, consider the Department of Energy (DOE) awarded over $16.4 Billion in loan guarantees to friends of, a.k.a., donors for Obama. Solyndra will be considered chump change considering the likely demise of First Solar backed by $4.7 billion in DOE loan guarantees, as best described in The First Solar Swindle. Scroll half way down the article to read “Favoritism” and beyond to recognize why the Stimulus was doomed for failure.